The Hotel Bernini Bristol is located in the heart of Rome in the splendid Piazza Barberini, close to the Spanish Steps, the Trevi Fountain and Via Veneto, making it the perfect base for a luxury city break. This hotel offers comfortable guest rooms finished in either a classic or contemporary style and equipped with modern facilities. 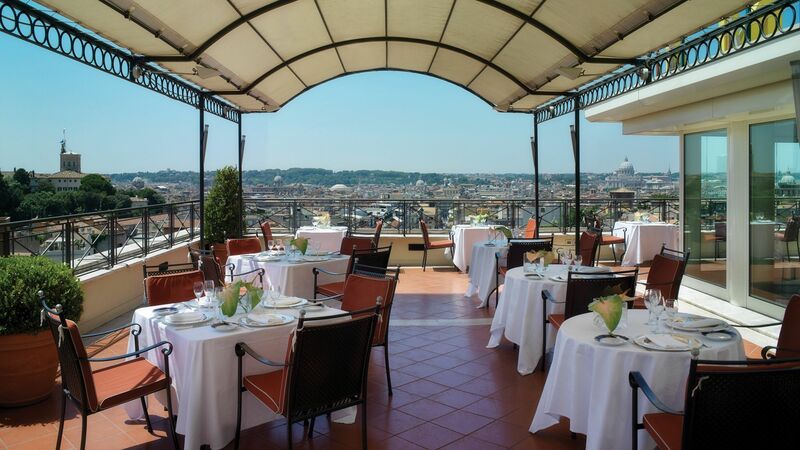 The Giuda Ballerino restaurant serves delicious food and offers spectacular views over the rooftops of Rome and St Peter's Dome, which can be enjoyed from the terrace during summer months. Restaurant Giude Ballerino is run by celebrity chef Andrea Fusco, and this Michelin-starred restaurant has just moved to the roof terrace of this five-star hotel. The highest quality products are used to create excellent cuisine that can be savoured in the modern surroundings whilst looking out over the rooftops of Rome. During summer, you can choose to eat on the terrace and enjoy views of St Peter's dome. 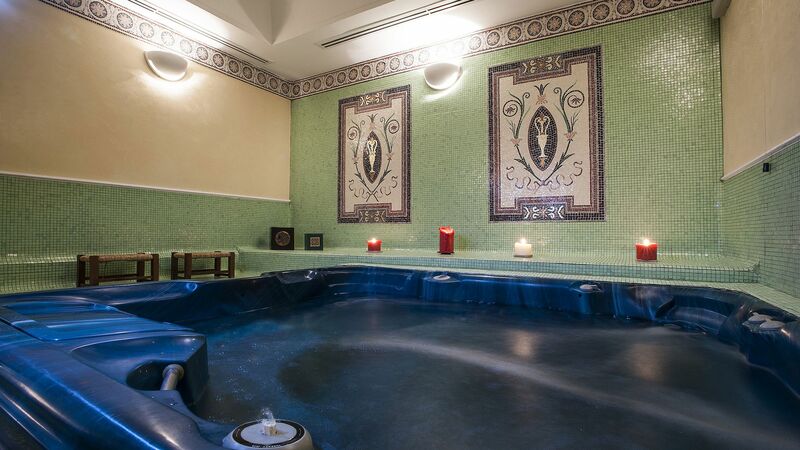 Enjoy the Turkish bath, sauna or whirlpool in this relaxing spa, as well as skilled massages by trained staff. A fitness centre is also available. Italy’s capital is brimming with history – around practically every corner you’ll find a centuries-old church, a Baroque fountain or a relic from Ancient Rome. The historic heart of the city (the centro storico) is simple to navigate on foot, so you can easily wander from the Pantheon to the Piazza Navona, or the Spanish Steps to the Santa Maria del Popolo Church. Across the Tiber River you’ve got Vatican City, home of St. Peter’s Basilica and the Sistine Chapel, plus the artsy neighbourhood of Trastevere, where cobbled lanes are lined with candlelit trattorias and wine bars. Pretty parks like the Villa Borghese and Parco Savello are spot on for relaxation – the former is also home to an art-filled museum, while the latter boasts a terrace with standout city views. 45 minutes from Fiumicino airport. Classic Rooms are decorated in a classic or contemporary style with Italian marble bathrooms and views over the streets of Rome. They have a double or twin beds and can sleep up to two adults. Superior Rooms are decorated in a classic or contemporary style and some have a view over Barberini Palace. They can sleep up to three adults and are available on request, please call to book. “ Really great hotel, beautifully furnished new floor of bedrooms with terrace/balcony. Rooms were very well furnished and decorated on this newly refurbished floor. Good air conditioning. Excellent ensuite and shower. Staff were very attentive and the concierge was very helpful. Good breakfast choices. Excellent location, could walk to the Trevi Fountain and many 'hop on and hop off' tourist buses stopped nearby. Taxi rank and Metro (closed for repairs at the moment) also nearby. Great range of restaurants to choose from in the area. This hotel is a great location for many of Rome's attractions but this is the only positive we found during our stay. Having been lucky enough to stay at a few 5 star hotels, this hotel does not rank with them. The noise... Yes the hotel is on a busy piazza but it is not the traffic noise that is intrusive, it is the constant slamming of doors (which you have to pull to close rather than turning a handle, consequently most people let them slam shut - including and most frequently the housekeeping staff). There is no soundproofing between rooms so we could hear EVERYTHING that our neighbours were doing. Not pleasant. The lifts bing every time someone gets on or off, the keys to the room buzz. Just constant noise and we are leaving exhausted and looking forward to a decent night's sleep at home! The room itself is pretty basic, not what one would expect from a 5 star hotel. The bed is too hard, the pillows uncomfortable. When we arrived they had given us a twin room despite booking otherwise. There were facilities to make tea and coffee but no tea and coffee supplied. We innocently phoned down to ask for some, some 15 minutes later it arrived with a 32 euro charge !!??!! We refused to pay. The staff member went away to speak to his manager, who called 5 or so minutes later, insisting that was the cost. We refused again and told them to come and collect the tray. 5 minutes later the phone rings again, this time we are able to have the tea and coffee for FREE, but only for tonight. How gracious. This is a basic room requirement!! A bottle of water was provided in the room when we arrived but make it last as it won't get replaced. The toilet doesn't work properly, the shower leaked. The rooftop bar? 30 euros for a G&T and a barcardi and coke. Really??!! We would not recommend this hotel. Other than location, it has nothing going for it. Shame.